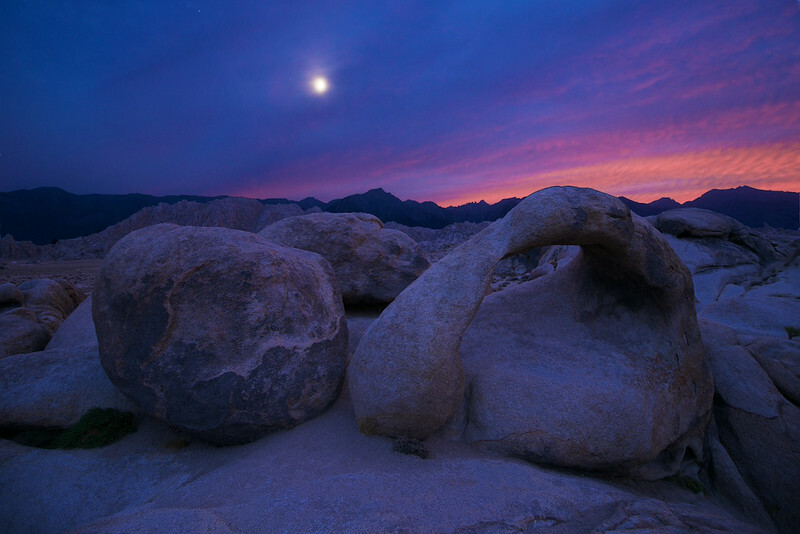 I am just home from the short weekend shoot in the Alabama Hills. It's barely noon here and I don't recall ever getting back so early from shooting the Eastern Sierra Mountains. Not only that, I got home early enough to get in a bike ride. It's raining today. I guess you could've figured that out from the clouds that were building last night. As you can see in this picture, there were lots of clouds building. The weather forecast said "30% to 40% chance of rain." I guess that translates to "100% chance of almost pouring down rain." The plan this morning was to shoot the arch at sunrise. I woke. I got dressed. I opened the door with a start ready to march out into the parking lot. Then, I noticed the pitter patter of rain hitting the ground. It wasn't quite pouring but it was sure raining and I had no clue. The darn air conditioner wall unit must've masked the sound so I was completely surprised when I opened the door. Oh well... I turned around and went back to bed. Actually, I turned around and worked the photos from yesterday. Here's the first of last nights images. More to come.